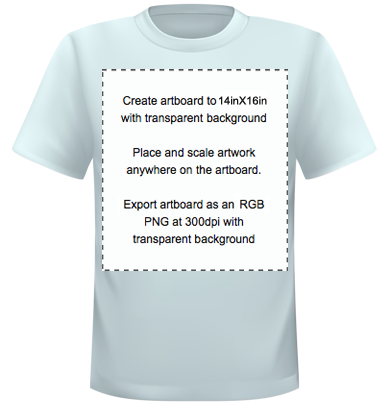 Here, at Dropshirt, we want to print the best possible job for your brand. This is why we have developed a system that ​helps you to create ​the best possible artwork file for maximum results. We do this by using a standard art board template size. This gives you the flexibility to get your design printed exactly how and where you want it positioned. Our print operators use a combination of the art board and your mock up images to determine where to print your design on the garment. Do you have a final print size? Do you know how big to make your design? If not! ﻿﻿Use this method﻿ ​to figure out how big you want your design to be printed. Resize your design to be that print size at a resolution of 300dpi. Prints larger than (~620cm2) incur an additional fee. Please note: Using a file that is lower resolution than 300dpi is not recommended. It can still be printed, but please remember that print size / quality can be compromised. If you are using a lower resolution image, please make sure your art board is the same resolution as your design. ​Where you want your design printed on the​ product is super important. We both want to get ​this part right. ​So, using a templated art board is the best system for controlling this aspect of the design process. If you want the "standard" position. This is centre ​chest or centre back print in a standard print position. Then your job is really easy. You can ​use a print file that is cropped to print size, saved as a .png file​, set at 300dpi RGB mode with a transparent background. Simple! ​​Tips for saving files: ​Photoshop ​will, in some cases, automatically save PNG files as 72 DPI. Please double check your files ​are in fact 300 dpi. Just open the file again and make sure it is really 300dpi before uploading to the dashboard. Download the following art board to add your design. If you don't use Photoshop, we explain how to create your own art boards below. Find free﻿﻿ alternatives here. Place and position your artwork, where you want it, inside the art board. Artwork Requirements: Save your file as a .png file, 35.56cmW x 40.64cmH at 300dpi RGB mode with a transparent background. ​Tips for saving files: ​Photoshop ​will, in some cases, automatically save PNG files as 72 DPI. Please double check your files ​are in fact 300 dpi. Just open the file again and make sure it is really 300dpi before uploading to the dashboard. Creating Artfiles: How to position your design inside the Art Board?